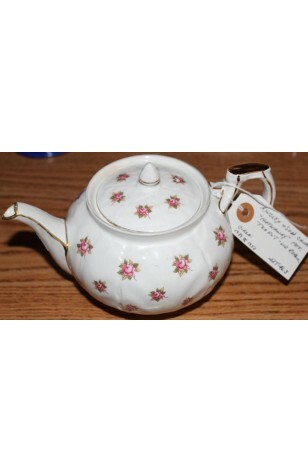 Vintage Aynsley & Sons Fine Bone China Tea Pot - Rosedale Pattern AYNROS, Made in England, Circa 1940's. This wonderful Aynsley Fine Bone China Tea Pot was made in England, having the Rosedale Pattern #AYNROS. A Crocus Shaped Tea Pot with small Pink Rose Bouquets scattered across, Embossed, on a White Background. The Rim of the Pot is Scalloped, Trimmed in 22kt Gold, as is the Handle, Foot, Spout and Knob on the Lid. the Rosedale Pattern, is similar to the Hathaway Pattern and could be used in either set.